First decorations for the Christmas season. My Christmas cactus surprised me and started blooming on its own. I moved it to my desk to keep the little quartet of wiggles company. 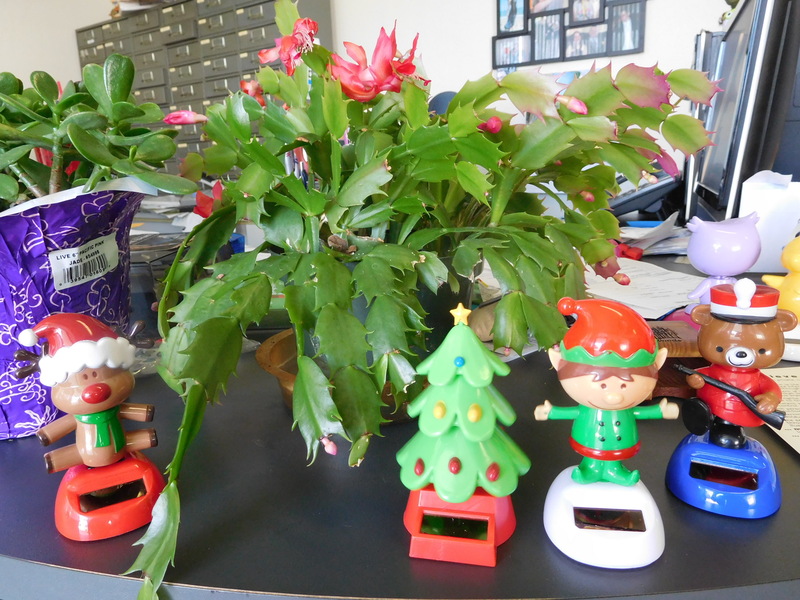 The cactus makes an easy decorations and it will only get more festive as the days go by. It surprised me. Sometimes it doesn't bloom until after Christmas and sometimes it only has a handful of blooms. There is a bumper crop of blooms this year. I counted another 24 buds besides the three blooms that are open. I expect that it will get brighter as more blooms open. There are 24 more buds forming on it right now. I love my little bobble guys. There are a couple more (snowmen and penguin) on the other side of the desk. My Christmas cactus bloomed like crazy last month and then it just broke in pieces... RIP Christmas cactus. Awww, that's too bad. Did you know that you can replant those pieces and start a new one? There are usually tiny roots at the base of each leaf section. The one I have is one of three that I made from an old worn out plant. 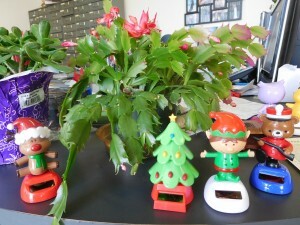 I want to get a Christmas cactus or two. I love those little guys! I just started to put up things for Christmas, today. Is it just me or did this year just FLY on by? The year has flown by which makes me gasp at the list of things I wanted to accomplish and didn't and now I have less than a month left. Where did the time go? I was looking at a white cactus to go with my red one but thought about it too long and they all disappeared from the stores. The one on my desk needs it's own pedestal. It's going to be so full that the blooms are going to be all over my desk.